I finished Mass Effect a few weeks ago, and it quickly climbed the ranks of my favorite games. It felt more like a real science fiction than any futuristic title I've played to date. Though I did not enjoy Fallout 3 nearly as much, they both succeeded in creating an environment with its own unique personality. And its set of inhabitants seemed as if they would go about their lives long after I turned off the console. John Doe Alien and Jane Doe Wastelander are both crucial in creating these living environments, too bad they talk too much. In order to create what feels like a persistent world, there must be a gaggle of pedestrian individuals to wander about and make each place feel "lived in." The job description for a videogame extra is simple: sit around with other NPCs , eat a bagel, mutter something about the weather, go home at night, done. Here is the problem as I see it: We make these prop characters more realistic by allowing the player to interact with them, but they don't have anything interesting to say. The fact is, most everyone is boring. So imagine an immensely interactive game, one in which you can have conversations with anyone you see, a truly realistic world. As players, should we feel obligated to experience each conversation in order to partake in all the game has to offer? Is there a fear that repetitive dialogue with unimportant NPCs will train us ignore everyone, thereby missing out on some compelling narratives when we pass by a more significant individual? Is it pessimistic to say a realistic game environment is a world mostly full of mundane and uninteresting people? Maybe it's a completionist tendency of mine, but I already feel compelled to talk to everyone whenever I play an RPG. As you can imagine, this can make walking through any RPG town a disgustingly time consuming endeavor. I may have spent more time wanding the Citadel in Mass Effect than exploring the far reaches of space. Likewise, I was more familiar with the labyrinthine halls of Fallout's Rivet City than I was with the remnants of Washington D.C. Most of the time in these places was spent tirelessly exploring every dialogue option available. 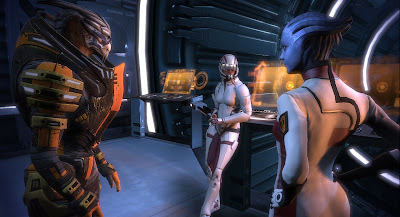 Most NPCs in Mass Effect will follow three tactics when interacting with the player. Some will say just a few words of greeting, or hostility, and remain essentially non-interactive. Some will give the player insane tasks to ask of a complete stranger (Seriously, the number of random civilians I assisted in Mass Effect is mind boggling. Why anyone would trust a space marine to solve domestic disputes is beyond me.) Lastly, some NPCs will tell you a great deal of unnecessary information about the world and those living in it (When does knowing the main export of an alien species come in handy?). < Having too many significant NPCs is distracting and unbelievable. In-depth dialogue trees with unimportant civilians is too often boring and uninformative. Now I'll admit, this could be partly my fault. I should probably take my mother's advice and stop talking to strangers. But if I can interact with anyone, how do I figure out who to talk to? One option is to make videogame dialogue more like a conversations in a stage performance. Because of set design and time restrictions, spoken words are chosen carefully and frequently advance the plot. Or perhaps its best to play the role of a upwardly mobile businessman, talking only with the people who matter. Another option is to borrow the improve dialogue options mechanic from these games, and incorporate relationships into Player-NPC conversations. 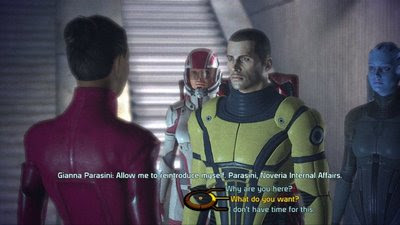 Instead of allowing the player to increase their charisma or intimidation, dialogue options can increase naturally from the type of interactions players have with extras. Stop by a bar and get some strange glances from customers and a gruff bartender. Frequent this same pub daily and the bartender may greet you with a free drink while Cliff from Cheers tells you all about his day. The inverse could also be true. Stop playing frisbee in the park every weekend, and maybe people change or forget about you. Understandably, this would require an expansive RPG set over a long period of time. I'm not trying to finalize anything, just theorize ways out of the tough position between storytelling and technological advancements that allow persistent worlds. Who knows what kind of star role a videogame extra can become. After all, a stranger is just a friend you haven't met yet. I think part of the problem stems from RPG's setting the main character up as the most important person in the world. You are saving the kingdom/world/galaxy/universe and as a result the designers feel as it's imperative to make everyone act as such. Even if you are the most important person in the game world does everyone have to know it immediately? Most people in the real world would ignore you if you tried to talk to them. This seems not to be case in video games. It's tough being a completionist that likes RPGS. I similarly feel the need to talk to all the dull townspeople in these kinds of games and this is often why I end up never completing these games. I get bored with the pedantic jabber and fetch quests that sidetrack me from the main story, and I end up bored of the whole game and switch to whatever the new thing is I just bought at the game store. It's sort of weird because I want to experience everything the game has to offer so I talk to every NPC, but if the game has too many boring NPCs, the game begins to feel more like a chore and the game is no longer a fun experience... yet I still feel compelled to talk to everyone whenever I do play. Maybe it's my fault? Maybe I should just focus on getting through the main storyline, which is what I presumably care about. But then why not play a more short and linear game instead of jumping into a giant, realistic, immersive RPG world? We gamers are a finicky bunch... we want games to be more and more realistic, but if they are too real then we get bored and stop playing them. 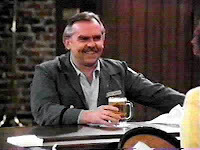 I like your idea about a "Cheers" style town where your relationships develop or deteriorate over time depending on the time you spend there. I think Persona 4 actually does this very well. The game takes place in a small town called Inaba where there isn't much to do. That may sound boring, but it works great for developing relationships because you frequent the same places and interact with the same people. Inaba becomes the place where everybody knows your name (and they're always glad you came). There are lots of NPCs that have different story arcs to play out if you will give them your time. And time is the factor that also prevents this game from becoming a completionist nightmare... you know ahead of time that the game will only last one calendar year and you know that you only have a few weeks to before the next boss battle has to be won. These constraints work wonders! You have to decide how to best divide your time between developing friendships, running errands, training, and self improvement. The constantly ticking clock prevents you from being a completionist because there literally isn't time for it. Strangely, this actually makes you care more about the characters-- you have to choose between them for who you want to hang out with because you don't have time to run through every character's tree of dialogue. In fact, I have found myself making choices to hang out with characters that were not the most advantageous for improving my stats, but I just LIKED HANGING OUT with them and felt their story was more important than was a +1 courage boost. I'm coming to a point in the game now where I am going to have to decide which of the characters I want to be romantically involved with and I'm actually stressing about the decision because I like several of the girls. I know if I date more than one at a time, then they can find out about each other and get jealous, but if I'm committed I have to turn a cold shoulder to other characters I grew to care about (there is a scene where one girl comes crying to you and asks for a hug. If you don’t turn her down, your relationship gets more romantically serious and that is bad if you are committed to someone else). And I don't want to cheat on the girls (even though I have the option to) because I don't want to see the story play out that way because of my emotional investment in the relationships and because I want my character to retain his honor and dignity. How's that for compelling virtual relationships? I share your experience of Mass Effect. I just finished my playtrough as well and even though it took me over 30 hours, I found the actual story rather short. Just the intro "dungeon" + 3 main missions + 1 final mission + a short final "dungeon". Where did all the time go? I guess I spend it talking to people. While the conversation were sometimes quite enjoyable, I really hated how the "investigate" option often made every random guy on the street spill out not only his entire biography (which was utterly pointless for any purpose) but also the history of his entire race. "What can you tell me about The Whocarsians?". Sounds to me like a bad case of "Tell, don't Show". - "Gee had the writes do these very elaborate background stories but there is now way for us to actually show this anywhere in the plot." - "No problem, just copy & paste the background story into the script. Problem solved." The fetch quest were utterly ridiculous. I'm supposed to be a "Specre", a most advanced and powerful secret agent in the galaxy. Travelling with my very own secret-technology Spaceship. Operating outside of law. Like a Jack Bauer but with his very own Space Ship. And yet this guy who I just met thinks that it is a good idea to ask me to do deliveries for him? And the game even expects me that I accept? What the...! Oh yeah and isn't it somewhat racist having a guy proclaim "We Whateverians are so and so." As if being a member of a species gives this guy a right to collapse an entire culture to a couple of soundbites. That's preposterous even with a singe Nation. How is he able to do that anyway? Wouldn't that imply that he knows humans well enough to grasp the perspective they come from and isolate the characteristics of his own species that would appear noteworthy to humans? Quite a feat for some dude. Krystian, the last part of your comment makes me think that debates over the nature of alien species would be a good way for a science fiction game to tackle issues about race within a game. It would be interesting to have a character argue back that "not all whateverians are the same". I have a thing against most rpg's. I believe the empathy that i could for his NPC´s is killed in the moment they become mechanical side-quest providers. I mean, the last time i went to a bar nobody asked me to find a medicine in the forest for his dying son. Why RPG´'s can't just have nice people to talk to? A town where nobody will discuss his species secret past, but instead will say the stupid things that we say to strangers? It's not about realism, it's about making me care. And rpg games have fall too in love for it's own paradigms that don't even try to amaze me. I'm with you on the "all important protagonist syndrome" rampant in games. Which is why, ridiculous simplification of relationships aside, Fable II actually does a pretty good job of having a middle ground. You can clearly become the powerhouse in the game, but depending on your looks, actions, and renown, people behave differently around you. You bring up a good, and somewhat sad point, with Persona 4. Like other games that have influenced the series, dating simulators actually do a decent job with npc relationships! (At least some of them.) Part of that is the time consumption the player can put into the game. Correct me if I'm wrong, but Persona 4 is a 40+ hour game. Thus, the Catch-22. I'm not entirely sure a reasonably sized RPG can accomplish similar success. Not to put either of our ideas aside, but I actually liked Mass Effect quite a bit. The universe felt fleshed out, even if its inhabitants didn't. Also, I had never thought of the essentialist aliens until you mentioned it. I'm with JT in saying this is a missed opportunity to turn these ideas on their head. What would you suggest in terms of NPCs to make these tasks more realistic? Should all or most tasks come from one or two individuals? Should you bump into other characters accomplishing these tasks? Should there just be a bulletin board with jobs to take? For an RPG with many quest lines, this is a serious design challenge. Actually, I think Persona 4 runs closer to 80 hours, sadly. I play it about an hour at a time every few days or weeks, so it is taking forever to complete. Only a game as good as this could hold my attention for so long. That doesn't mean that the mechanic couldn't work in a shorter game though. I wonder if an MMORPG could have really interesting characters by having players play different quest lines that intersect with other players. Like, say all of the elves have a certain set of goals and a narrative trajectory to their mission, and all of the orcs have another set of goals and a narrative trajectory to their mission. Depending on whether you chose to be an elf or an orc, when the storyline's cross, you have to develop relationships with other humans, but you all have to play a role to succeed. Maybe you chose to be an orc, but you need an item that only an elf can get for you and they won't give it to you unless you play an interesting enough NPC role for them (thus creating a fetch quest with real human interaction). If a game designer set the right rules and constraints (with penalties for breaking characters or backstabbing), you could possibly get other humans to play the role of townspeople and it would be a bit more interesting. I've never played an MMORPG though, so I don't really know how they work and if my idea could be pulled off. The MMO idea is a good one, and actually, I think MMOs do a decent job with NPC characters. For the most part, breaking down the realism isn't an issue because many quests do seem like generic missions for any passerby. Also, when you've completed a task, you usually leave the area and never bump into that NPC again. Presumably, they're done with their task. As for race-specific quest lines, I recommend looking up info about Bioware's upcoming Star Wars Knights of the Old Republic MMO. They purport to be working on class based quest lines. All this talk of RPG dialogue has me thinking about the upcoming Star Trek MMO. Star Trek has always been largely based on science and diplomacy, which means that if a game wants to capture the essence of the universe, there must be extensive dialogue work. I'm a bit worried about how it will turn out, since Eve Online is more like Star Trek than any Star Trek game out there: the real action is the political intrigue. Trying to break free from the dull dialogue-tree template while building a dedicated audience is a tall order. Star Trek is also a perfect vehicle for discussing the race-based RPG dynamics mentioned by few people: many of the Star Trek empires are organized around race and inter-species relationships are not uncommon. I'm sure you'll be sad to hear, then, that the Star Trek MMO campaign storyline has been scrapped for a heavier focus on a PVP/Multiplayer based system. That's a tough question. I'm not a game designer so i'm not able to give a reasonable answer to you. I will try to give at least a passable one. I’m not saying that all rpg’s behave this way all the time, but there always those moments where you’re going to a new town and the game says you’re supposed to care but you are just looking for the loot and new equipment. We all enter the houses looking for chest, and usually if there’s one we will open it before talking to anyone in the place, and that’s not exactly a bad thing, but if the objective is to create a believable npc-pc relationship the thing is broken. Your alternatives are great, I liked the idea of only few npc’s giving you quests, but if not well done they will make the same old mistakes. My problem is not that all townspeople are quest providers but that they are nothing more than that. The solution to this is not at my sight, but maybe, and probably this is just nonsense, all we have to do is to give the npc’s something remarkable instead of five pages of dialogue about his antecessor’s. People cook, walk, and laugh, then why not make a man that cook something in the cutscene? And if you do manage to save his dying son you could return with a dead animal that he would make a lunch for you. Or an old man that is very rich and monopolizes the shops in the town but if you kill a bunch of wolves that haunt the trade paths other merchants will start to open his own shops, and probably sell cheaper weapons to you. I don’t if I was clear and my solutions were not that nice, but I hope there’s something useful there. And I enjoy rpg’s a lot, but not for the reasons that are usually used to convince people to play them. Damn you for ruining my Star Trek video game hopes. Of course, I should probably just blame KHAAAAAAAAN!!! I could be misinterpreting you, but it sounds like you're suggesting that having townspeople act as quest-givers isn't a problem, as long as the scope of the quests is believable. For example, a simple baker might not know of some huge dungeon that houses a legendary sword, but might like it if you took five minutes to help him bag flour. The quests might be mundane, but at least they would fit in a contextual sense. Late comment is late (as usual) so hopefully you guys still have the chance to read it. To move away from the dialogue discussion here, I want to say that Mass Effect's narrative as a whole really resonated with me. Upon finishing it I immediately compared it to Battlestar Galactica in my head. It doesn't matter what you think of the show or specific things related to it here, for me the show showed just how immersive science fiction can be and I believe the same applies to Mass Effect. The first game in the intended trilogy laid the foundations, setting the plot of the series, introducing us to the characters and species, populated (and non-populated) planets and stuff like that. There were hints to themes that could be explored, hell there was themes that were explored, but now the game is over I can only look forward to the sequel due to the massive potential it has to explore some really interesting things. I really hope it ends up being what I expect (whatever that actually is) and manages to justify the feelings I have towards the first game. It introduced me to the potential so now it's time for the next two games to meet, perhaps even exceed, it. As an aside, I actually plan on playing through the game again in the near future - both to serve as a refresher and because I have the two novels waiting to be read as well. I'm looking forward to expanding the story, as well as seeing what it is like to participate in all that is available so far for it, at once. And yes, I do plan on writing about it so hopefully I can find something really interesting to talk about. Never too late to jump in! I think you raise a good point about evaluating the writing of a game that seems to be meant to be part of a series: perhaps the writing, bad or good, is that way to purposefully set up the subsequent episodes. I'll be interested to read your posts about the game and see if the game holds up a second time through.